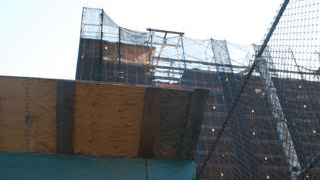 A view of the scaffolding and construction at Bard High School Early College. Photo credit to Emma Bally. ‘17. For BHSEC students, the sight of cranes and sounds of construction have become ordinary. East Houston is littered with construction sites, and Delancey boasts a few of its own. Scaffolding greets students and faculty every morning as they approach the school building. For many, it feels as though the scaffolding has been looming over BHSEC’s front doors for at least a thousand years. Unfortunately, it appears as though the construction will take approximately a thousand more. Hopefully, the renovations will indeed be worth the 1,000-year wait. In the meantime, students and faculty can at least enjoy the shade cast by the ever-present scaffolding outside the school building.